Plenty of space on the big lagoon! In Dakhla the whole team is happy about your first meters! Kitesurfing is a sport that every active person can learn nowadays. In general, nobody is too young or too old to learn this action-packed sport, also called kiteboarding or kiting. The assumption that you need a lot of strength and well-trained muscles for kitesurfing is also a mistake. The trapeze distributes the power to the whole body and not only to the arms. 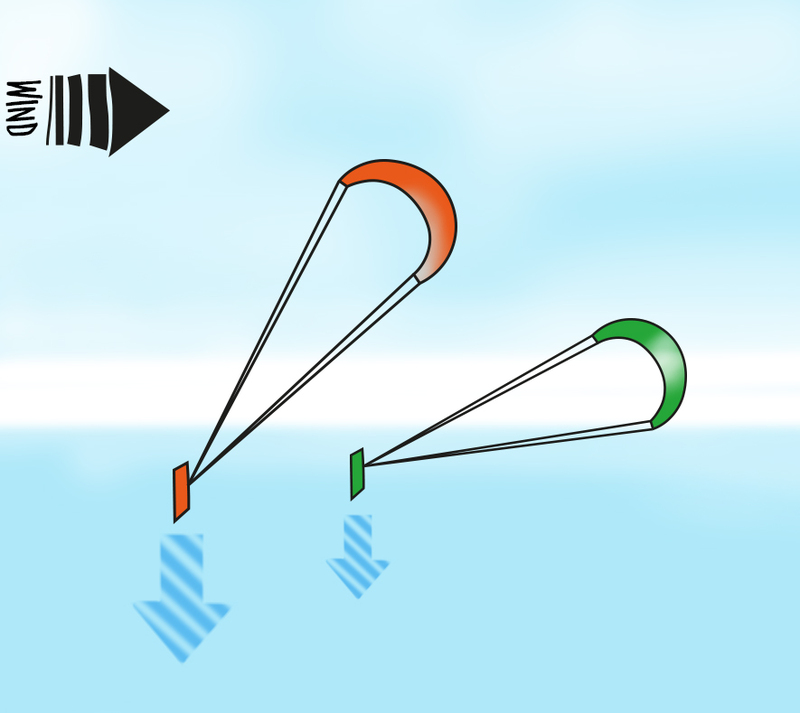 To learn kitesurfing, a seat harness is usually used. Since the kites have become much safer in the recent years, kitesurfing is accessible and learnable for everyone. This feeling, when the wind carries you over the water while kitesurfing, is incredible. An advantage for everyone who wants to learn kitesurfing: You don’t need any previous knowledge. But you should go to a reputable and licensed kitesurfing school if you want to learn kitesurfing. Ideal conditions to learn kitesurfing can be found in a special kitesurfing holiday. In the following we have listed the most frequently asked questions about learning to kitesurf and try to answer them as good as possible. Have fun learning to kitesurf! First of all: Kitesurfing, or kiteboarding, is one of the coolest sports you can do on the water at the moment. Not only will you experience the ultimate feeling of freedom as soon as you are able to ride the first few meters, kitesurfing is also super easy to learn and with the right kitesurfing course, progress is going fast. Kitesurfing is also a very varied sport. You can either cruise on flat water lagoons, jump and later practice some tricks or go kitesurfing in waves with a waveboard. Especially in the last years the hype about kitefoiling has become very big again. You glide on a special board with a mast underneath without any resistance over the water and you can go kitesurfing already from 8 knots. So kitesurfing is never boring and even if you are a bit overwhelmed after your first kitesurfing course, you will quickly find your own kitesurfing style and make fast learning progress. Here’s a little glimps of what it means to learn to kitesurf and glide over the water – the ultimate feeling of freedom! 2. What do you need to learn kitesurfing? For kitesurfing you need much less equipment than for windsurfing. The kitesurf boards are much smaller and have no volume (except waveboards). So they fit in even the smallest car. The kites (the kites that let you glide over the water) are all stowed in handy bags and at the beginning you don’t need more than two different sizes of kites. Especially if you want to learn kitesurfing, it is advisable not to buy your own equipment before the kitesurfing course. In professional kitecenters you will always find equipment that has the latest safety standards. Besides board and kite you will also need a wetsuit, harness, helmet and buoyancy vest. Depending on the season or kitesurfing area you will also need neoprene shoes. These little things will also be provided for the kitesurfing course in every good kitecenter. Do I have to be extremely fit to learn kitesurfing? Safe to say: no. To learn kitesurfing you don’t have to look like the fitness models on Instagram or Facebook. You don’t have to be a marathon runner or weightlifter. In our kitesurfing courses we take care of people of all shapes, sizes and ages. Between the ages of 14 and 80 we have had students who have learned to kitesurf. In general, you should not have any physical impairments that do not allow sport before your kitesurfing cours. If you are not sure whether you are allowed to learn kitesurfing, it is advisable to go to a doctor before you learn kitesurfing. You should be able to swim safely and not be afraid of the water. 3. Do I need a professional course to learn kitesurfing? Especially if you are still a kitesurfing beginner, it will be difficult or impossible for you to know possible dangers when learning to kitesurf. This starts with choosing the right kite for the wind speed and ends with general weather knowledge. The international hand signals and priority rules are also very important on the water, because nobody will hear you screaming “Out of the way!! !” at 25 knots. In a professional kitesurfing course you will not only learn to ride the first few meters on the board, but also important topics such as the safe assembly and dismantling of your equipment, a spot check and of course all the right of way on the water. We also recommend that you combine the kitesurfing course with a kitesurfing holiday. Here you are already in a relaxed mood and can concentrate on your progress on the water. All teachers must be certified. Reliable certificates are from the VDWS and the IKO. Here you can be sure that the kitesurfing instructor had a qualified training and can safely teach you how to kitesurf. Pay attention to the equipment provided by the kite school. It should not be older than one season and there should be no signs of wear such as worn lines or cracks in the canvas. You’re at the right school when they also teach you safety topics such as the professional assembly and disassembly of kite equipment, correct take-off and landing with the corresponding hand signals, spotting and weather assessment. It is better to book a course that takes longer than three days. Of course these are more expensive than the trial courses and kitesurfing courses in three days, but: it is much more likely that after five to seven days you will really be able to do the waterstart and ride a few meters than after three. Afterwards you can either do an advenced course or, if you already feel safe, continue practicing on your own. By the way: all KiteWorldWide Kitecentres offer you all of the four points mentioned above and therefore excellent conditions to learn kitesurfing. But why do you find the best conditions to learn kitesurfing during your kite holiday? Licensed VDWS trainers offer you the best possible help to achieve your first successes on the kiteboard. During your holidays you will learn to kitesurf in a relaxed way and without time pressure. Learning kitesurfing in our selected kitespots offers a big advantage, the wind is constant and therefore ideal to learn kitesurfing. Just like the small training groups and the individual help. If you learn kitesurfing on holiday, you don’t have to worry about falling into the water. The warm water temperatures or even shallow lagoons are not only a paradise for kitesurfing beginners. Such lagoons can be found on Djerba, in Dakhla, Egypt or Sicily. Whether you travel alone or in a group, the community feeling is guaranteed. 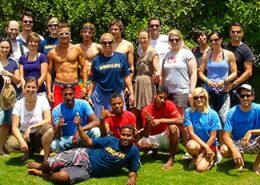 Everyone, whose heart beats for kitesurfing or who want to learn new kitesurfing, comes together here. You will also experience the unique culture and breathtaking landscape of a country – either by learning to kitesurf on the water or one of the many other activities. Whether exploring the beautiful old town of Essaouira, snorkeling in the turquoise waters of Zanzibar or a jungle safari in Kalpitiya. If there is no wind to learn kitesurfing, there are still many other adventures to experience. 4. 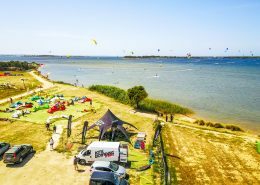 Which kitesurfing destinations are suitable for learning to kite? 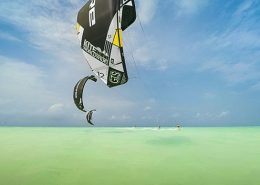 The Kite Learn Event in Sicily in cooperation with Kiteboarding Events - Exclusive at KiteWorldWide. 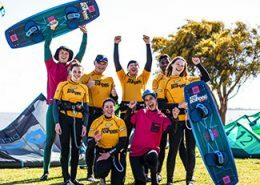 You can expect the experienced Kiteboarding Events trainer team, a huge material pool with test kites and boards of different brands and of course support by the KiteWorldWide team on site. Empty spots, wind and kiting, kiting, kiting! The little paradise, called Tatajuba, pleases everyone with one of the best shallow water spots and the most reliable and strongest wind of Brazil! 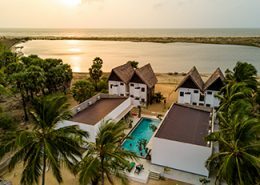 KiteWorldWide Lagoon Lodge Sri Lanka / Kalpitiya. 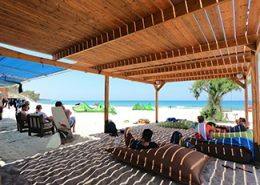 Comfortable lodge located right at the huge flat water lagoon with extreme high wind guarantee and two seasons: from May until October and from December until March. Discover this awesome kite-island with KiteWorldWide! Crystal clear turquoise water, steady winds and huge flatwater areas await you from december to march and july to october. 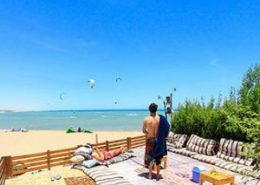 Our Kitesurf Spot in Egypt - between Hurghada and El Gouna, Hotels directly at the Spot, brandnew Kite Center with F-One gear, Flatwater lagoon with shallow water - limited spaces for more space on the water! Great kitesurfing conditions in March, April, June, July, September, October and November! No matter if you are a total beginner or advanced with your own gear or rental. During the kite learn events our experienced and fully licensed Kite instructors will help you with everything that you want to learn. Schedules for spring, summer, autumn and winter you will find on our website! Mastichari on Kos is the new spot for everybody that wants to get into the world of kitesurfing or to improve his or her skills. Nice kiteschool, beautiful accommodation and ideal also for families. Season is from April to October. A huge lagoon with throughout flat and shallow water throughout. The short distance to the African continent is responsible for the warm and pleasant temperatures from March until November. On top of that two different wind systems, which create constant wind. 5. Is it dangerous to learn kitesurfing? Kitesurfing has become safer and safer in recent years and there’s nothing wrong in entering the world of kitesurfing if you can swim safely and have a normal fitness. Nevertheless, do yourself and the other kiters a favour and make sure you do a professional kitesurfing course. Here you will learn to kitesurf safely and how to avoid putting yourself and others in danger. 6. What equipment do I need to learn kitesurfing? Especially at the beginning, when you learn kitesurfing, you don’t need your own kite equipment. It’s probably gonna be hard for you to choose between all the different brands, shapes and designs and there is a high probability that you will buy the wrong equipment. This makes it more difficult for you to learn a sport that is supposed to make most of all fun! As mentioned before, in a good kitesurfing school you will find the latest equipment to learn kitesurfing with. If you feel comfortable with the equipment after your course, just talk to your trainer about which kite and which board he or she can recommend to you. 7. Do I have to know anything before the kitesurfing course? Join Anne and Tabea from the KiteWorldWide office in Hamburg for a complete kitesurf beginners guide which includes 12 short videos. Attention: This course is not intended to replace a course provided by a professionel kitesurf school. It should only serve you as a preparation for a kitesurf course or as a refresher. To learn kitesurfing in a safe environment, you should attend a course provided by a certified kite school. Have a look at our hand picked destinations for beginners, where we offer the perfect learner packages to suit you. High wind likelihood combined with nice weather and good learning spots. A special thanks to our media partner Gleiten.TV for the production of this tutorial. In this kitesurfing learn video Anne shows you how the kiteboard is built. Furthermore how to mount the fins, footstraps and the handle to learn kitesurfing safely. right terms of kitesurfing, you should watch this video! Regarding the perfect spot for kitesurf of course, there are various statements and myths. On the quest for a suitable spot to learn kitesurfing, you’ll constantly hear numerous people saying that this or that particular spot, is the perfect spot. Even though, all spots are usually quite different from one another. Due to the fact, that we are offering a large number of different destinations and also running six kite schools, we have gained a lot of experience, which we would like to share with you. Here are some basics to keep in mind, when looking for the perfect spot. The most important factor to learn kite surfing is a high wind likelihood. It doesn’t matter where you are, if you don’t have wind, you won’t be able to complete a course. We have learned, that the power of wind is rather unimportant. Everything in a range from 12 till 40 knots works, since nowadays small as well as big kites work very well and offer the needed control, safety and re-launch capabilities. Typical light wind areas preferred by our kitesurfing beginners are Zanzibar or Kos in Greece. Many say, that strong winds would always bring some problems. We disagree, what usually causes trouble are the gusty winds. In Tatajuba (Brazil), one of our learning destinations, we made rather positive experiences with strong winds. Due to an almost 100% chance of strong winds, we mostly practice on 3-7m kites and see constantly good learning success by our students. 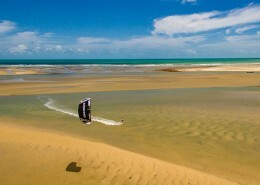 A lot of people say, that you need shallow water to learn kitesurfing. The truth is, that it gives beginners a certain secureness and that it does support progress during the first hours. However, to avoid injuries, you should watch out not to land – out of reflex – with your feet first. It is very important to practise in deep water, too. So that later the transfer is not to difficult. You can find flatwater spots, to learn kitesurfing, in Egypt, Dakhla in Morocco, Kalpitiya in Sri Lanka and Zanzibar. But deep water is not a barrier for a professional kite schools. In Tarifa or Kos (Greece), you will also find many schools, which teach in a professional manner in deep water. As a perfect compromise, we know some areas where the wind blows side-onshore and the water only becomes deep gradually. In this way, you can stand the first 50-100m but at the same time you get a good feeling for deep water (e.g. for body dragging). Such areas are for example Essaouria or the lagoon Langebaan near Cape Town. yourself or damage the kite when you start learning kitesurfing. and how to attach the lines correctly. This steps are very important for a safe kitesurfing session. In this video you can see what the first flight attempts with a trainer kite look like. Starting the first practical exercises with a trainer kite is a great start when you learn kitesurfing. kitesurfing on the water and how to release the kite on the water in case of an emergency. The right of way rules are a crucial part of learning how to kitesurf. If you learn kitesurfing, becoming familiar with the right of way rules should be one of the first points on the list. Don’t be afraid of the theoretical part of kitesurfing, it’s easier than it might look at the beginning! When passing upwind, you need to focus on the position of your Kite. The rider passing upwind has to pilot his kite overhead. 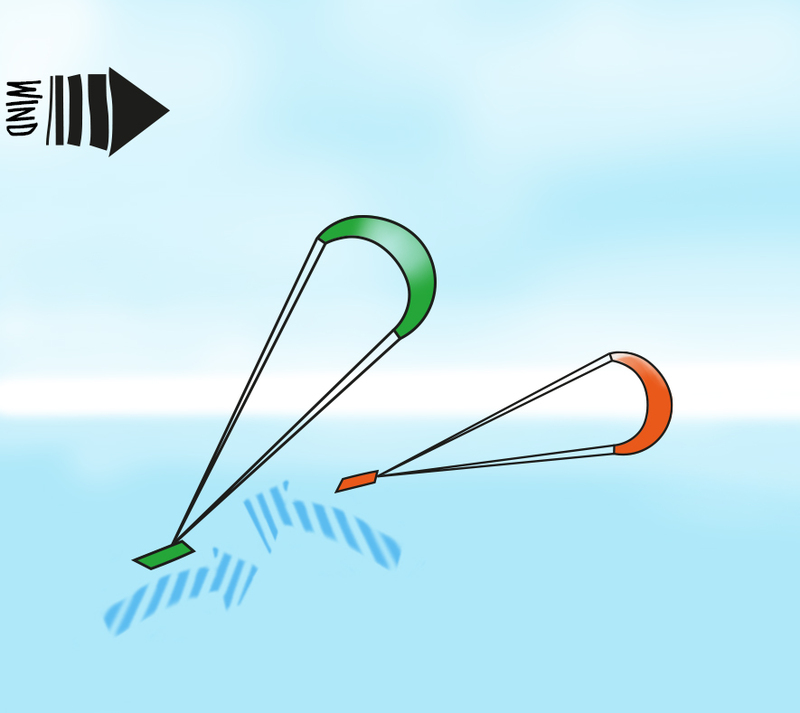 Consequently, the rider passing downwind has to pilot his kite as low as possible. The rider with the right hand forwards on the bar has priority over the oncoming rider (left hand forwards) and should keep the course. The rider with the left hand and shoulder forwards on the bar has to give way and adjust the course downwind. The windward (the direction upwind from the point of reference) kitesurfer always gives way to the leeward (the direction downwind from the point of reference) kitesurfer. In this video of the kitesurfing learn series we deal with launching and landing. Anne shows you what the kitesurfer and the starting helper have to consider before you go kitesurfing on the water. 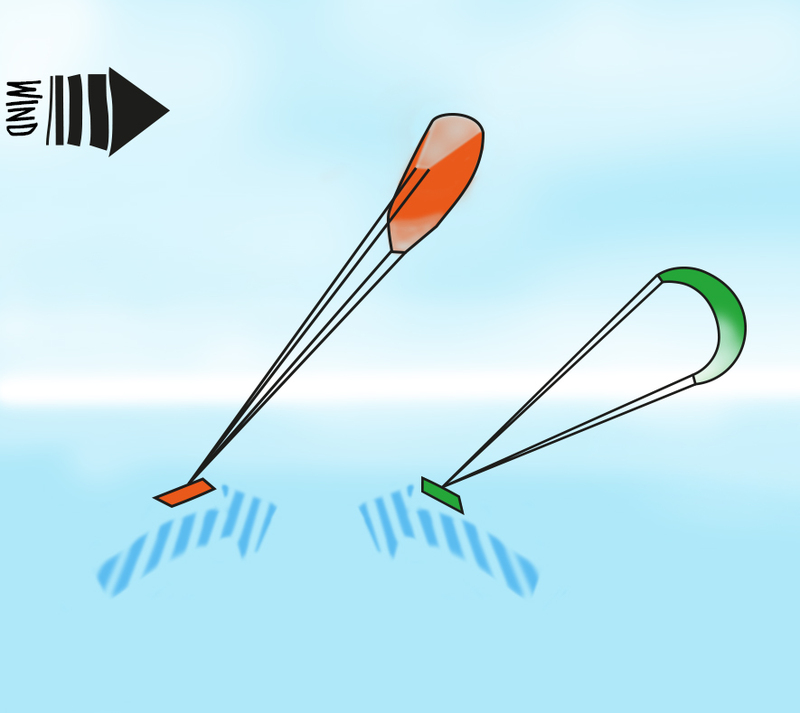 and what to consider when it comes to steering and controlling the kite. exercise you do while learning to kitesurf in the water. In this kitesurfing video you will learn how to launch your kite on the water. Sometimes the kite falls down and you have to launch it out of the water again. Anne shows you in this video some preliminary exercises for the board start. for thesuccesfull learning of kitesurfing. Last but not least: the board start. This video shows you the starting process for the ultimate feelingof happiness on the board. At that moment you know that all the practice and sweat pays off.